If you’ve had enough of the tourist crowds milling about on the plaza and want to go eat somewhere beyond the sphere of Shakespeare, head down into the Railroad District to this cozy French bistro. Be sure to start with the French onion soup, which is excellent. After that, you could opt for the Tuscan eggplant Napolean or pan-seared duck breast with blackberry sauce, though the pepper-crusted filet mignon is probably the most popular entree. At lunch there are pizzas, panini, and lots of interesting salads, including a lemony Caesar salad with tiger shrimp and a warm goat-cheese salad. Before you can really decide whether Lela’s Cafe is for you, you should know what a cafe is. How is a cafe different from another type of restaurant? 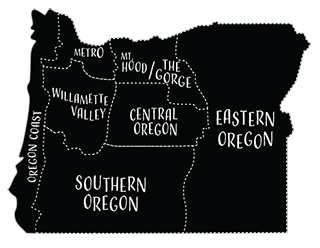 The term has different meanings depending on geography. For instance, in Europe, cafes only sell coffee (which makes sense, given that cafe is French for coffee). However here in North America we’ve expanded the cafes role into that of a combined coffee shop and informal restaurant. Cafes don’t have dress codes and their menus are generally simpler and less expensive than the fare at a regular restaurant. 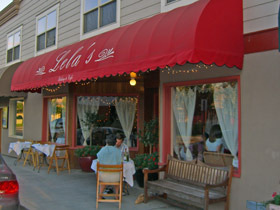 So what kind of food can you get at a cafe like Lela’s? Well, Lela’s has a more expansive menu than most, covering the full range of dishes from filet mignon to cheese plates to paninis to chicken salad sandwiches. However in most cafe’s, the focus is on food that is simple and easy to prepare, such as sandwiches, appetizers, soups, and nachos. Depending on the cafe, dishes usually sell for between $5 and $15, which is much cheaper than the average restaurant. Cafes still offer the option to have a sit down meal, but most do not have wait staff. Instead, you order at the counter. The beverage spectrum is what going to a cafe like Lela’s is really all about, however. Premium, hand made, gourmet coffee is what cafes are known for. With various blends such as Irish Creme and Cafe Mocha, a coffee lover can keep coming back every day for a month and still not run out of beverages to order. Other drinks like teas, Italian sodas, and specialty holiday concoctions like peppermint hot chocolate or pumpkin chai are also hallmarks of cafe beverage menus. Some cafes, like Lelas, even have a wine list, and most have decaffeinated, non-alcoholic options like soda, juice, and smoothies for kids. There are plenty of occasions in which a trip to the cafe would be appropriate. Some people like to stop in on their way to work for their favorite type of gourmet coffee. Others like to meet up with friends and coworkers at a cafe for lunch or to catch up over a cup of coffee. Still others prefer to have their first dates in an informal setting like a cafe. Cafes are also great places to go with the family for dinner or to stop in some evening for a peek at their dessert menu.